RIO DE JANEIRO, BRAZIL – Iberdrola, Spain’s largest energy company and worldwide leader in wind production, has announced that it will acquire 99.68 percent of Elektro, a private utility company in Brazil, from Ashmore Energy International (AEI) for US$2.4 billion in cash pending the approval of the Brazilian Electricity Regulatory Agency (ANEEL). Elektro worker, photo by Elektro. Iberdrola has been present in Brazil since 1997 and is likely to merge Elektro with Neoenergia of which it holds a minority stake. Elektro was formerly won in a privatization bid in 1998 by Terraco Participacoes S.A., a subsidiary of Enron. In 2006 the company was acquired by AEI. Its presence in Brazil today consists of “2.1 million clients in 223 cities in the State of São Paulo and five cities in Mato Grosso do Sul – an area of over 120 square kilometers,” according to the company’s website. 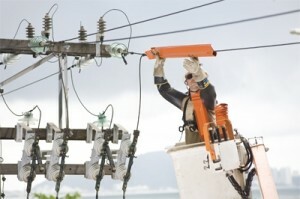 It is headquartered in Campinas in the State of São Paulo and currently stands as one of the largest electric distribution companies in Brazil. These developments come at a particularly interesting time for Brazil’s energy sector. In late-December, the Brazilian National Development Bank (BNDES) announced that it would provide a loan to Eletronuclear (Eletrobrás Termonuclear S/A, Brazil’s government-controlled nuclear energy company) for a total of R$6.1 billion to finance Angra 3 – the country’s third nuclear power reactor. 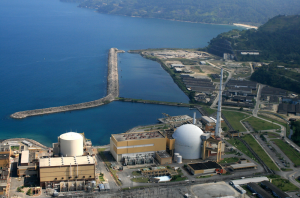 Angra Nuclear Power Plant in Angra dos Reis, Rio de Janeiro State, photo by Electronuclear. The BNDES loan is to cover 58.6 percent of Angra 3’s total projected development costs. It will be constructed as part of the PAC Growth Acceleration Program (Programa de Aceleração do Crescimento) which includes provisions for developing the country’s energy, sanitation, housing and more. Angra 3 is expected to be ready for use in 2015 – just before the 2016 Olympic Games to be held in Rio de Janeiro. Construction of Angra 3 began in 1984 but was stopped in 1986. When finished, it is expected to have a capacity of 1,405 megawatts (MW) and will be added to the National Interconnected System to which existing Angra 1 (657 MW capacity) and Angra 2 (1,300 MW) reactors are already connected. The majority of the equipment had already been purchased before the project was stalled in the Eighties. It has since been maintained in storage. BNDES boasts that Angra 3 will bring a greenhouse gas emission-free source for power, 9,000 temporary jobs for the reactor’s construction, 500 jobs after the reactor is built and a potential to produce 10.9 million megawatts per year. The 10.9 million megawatts will be able to power the cities of Brasília and Belo Horizonte for a year, states the Eletronuclear website. Just last week the Wall Street Journal reported a competitive loan offer to Eletronuclear for further construction of Angra 3 with a repayment schedule of thirty years by a group of five French banks. The offer awaits approval by Brazil’s Senate. The Angra Nuclear Power Plant is the only nuclear power plant in Brazil to date, and is located in Angra dos Reis, Rio de Janeiro, Brazil.